Back in June, I complained about an email I received from Kristen Gillibrand. Gillibrand is pictured above. She represents the State of New York in the United States Senate. Click the link to see my earlier blog posting, objecting to an email communication that I judged to be manipulative and insincere. It turns out that I am not the only one getting emails from Gillibrand that profess a false familiarity, accompanied by an appeal for money. When I go to sleep at night or gather my team to talk about our priorities, I think about you. Ben didn't buy this claim, any more than I bought Gillibrand's statement that she was "inspired by my courage, resilience and persistence." 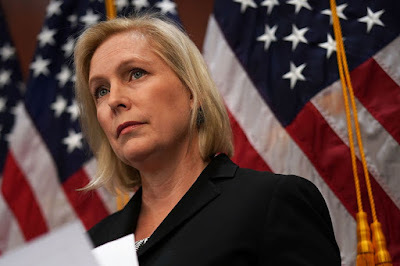 I have all those qualities in spades, of course (at least in my own mind), but since Gillibrand doesn't know me from Adam, I can't really credit her statement that she has been "inspired" by how I have demonstrated these qualities. As The New York Times noted in a recent article, Gillibrand is tilting her economic positions to the "left," towards "populism," as she contemplates a campaign for the presidency in 2020. In terms of my own political positions, that sounds like a change for the better. However, as The Times article notes, there are those who worry that Gillibrand's statements are evidencing the "what do I need to do to get elected syndrome," without actually disclosing what she truly believes, or what she would do if elected. In all fairness to Gillibrand, lots of politicians are taking the "false familiarity" path to money raising. This blog posting is a second plea to our politicians not to head down that road. Now, more than ever, we need politicians who are honest, and who will actually tell you the truth. Sending out fund-raising appeals premised on the idea that the recipients will be flattered by false statements (statements that are intended to make them feel good), doesn't bode well for dislodging the guy we have in the White House now. He's pretty good at false statements. 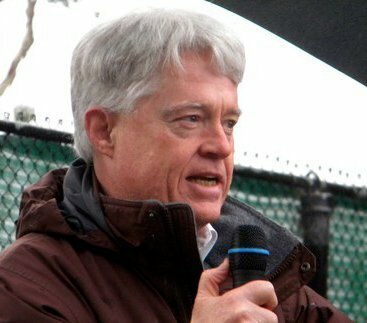 Immediately after having published this blog posting, highlighting a campaign email from Kristen Gillibrand, I received an email from Alexandria Ocasio-Cortez, the Democratic Socialist candidate who just won a Democratic Party primary against a powerful "conventional" Democrat, in New York's 14th Congressional District. I am sorry to have to report that this heroine of grassroots politics has quickly succumbed to the same kind of political consultants who have been providing advice to Democratic Party politicians like Gillibrand. Addressing me as "Gary" (we have never met and I have never had any contact with her at all), Ocasio-Cortez began her money pitch this way: "Gary .... let me start by telling you how impressed I am with you ..."
Alexandria. Let me start by telling you how unimpressed I am with this fake familiarity. While we have never met, I at least do know something about you, having read about you and your recent victory in New York City. From what I know, I am impressed with YOU, but I am not impressed with this tactic. Please! You can do better! You could write a money pitch that does not present itself in a fundamentally dishonest way, appealing to me with false flattery. I would like politicians whose political positions I support to be honest (in all things). Good point! I hope she gets the feedback!